Flipped learning is a methodology that helps teachers to prioritize active learning during class time by assigning students lecture materials and presentations to be viewed at home or outside of class. One of the most exciting advancements in the modern classroom is flipped learning. It hinges on the idea that students learn more effectively by using class time for small group activities and individual attention. Teachers then assign students lecture materials and presentations to be viewed at home or outside of the classroom day, prioritizing active learning. According to Kari M. Arfstrom, cofounder of the Flipped Learning Network, flipped learning is all about creating opportunities for active engagement. It’s “a pedagogical approach in which direct instruction moves from the group learning space to the individual learning space, and the resulting group space is transformed into a dynamic, interactive learning environment where the educator guides students as they apply concepts and engage creatively in the subject matter,” she explains. The flipped learning approach is gaining traction every year. According to a 2014 survey from the Flipped Learning Network, 78 percent of teachers said they had flipped a lesson, and 96 percent of those who tried it said they would recommend it to other educators. This indicates that flipped learning inspires teachers to update traditional methods and bring new technology into their classrooms through the use of video, screencasts, and more. But what exactly does this mean for classroom teachers? First, they are able to spend more time with struggling students while allowing more advanced learners the freedom to work ahead. It’s large-scale differentiated instruction, built into the curriculum at every opportunity. Teachers explain a concept to students either on video or through presentation software with voiceover. Students can watch the content before class and prepare for the day’s activities. This “gives them freedom over how, when and where they learn — and it lets them engage with the video content in the way that suits them best,” according to the Flipped Institute, an online resource that aids teachers in moving from traditional classroom lecture to the flipped model. Because the students are already familiar with the material when class begins, they can spend their time collaborating with their teacher and other students to solidify their understanding, either individually or in small groups. “Less ‘sit and listen’ equals more ‘do and learn’ — and the flipped model is making class time more enjoyable, productive and engaging for students and teachers,” the Flipped Institute continues. Technology allows teachers to make the most of classroom time and foster student-driven learning. Currently, high schools and institutions of higher education are leading the charge in adopting the flipped learning model. For more than a decade, the National Center for Academic Transformation has helped colleges try out flipped learning methods “across math, science, English, and many other disciplines,” according to industry journal Education Next. According to an online survey by the Flipped Learning Network and Sophia Learning, the flipped learning method is most frequently used in science and math classrooms because of the close relationship between STEM subjects. In fact, 33 percent of teachers surveyed taught math and 38 percent taught science. There was, in addition, a significant increase in language arts teachers who were flipping classrooms: an increase of 11 percent from 2012 to 2014. Flipped learning is also most frequently practiced by experienced educators: On average, eight out of 10 flipped teachers have more than six years of education experience, and 42 percent have been teaching for 16 years or more, Extension of a Review of Flipped Learning explains. Teachers have good reason to stick with the flipped approach: The Flipped Learning Network reports that 67 percent of surveyed instructors saw an improvement in student test scores after utilizing the flipped learning model, and 80 percent reported an improvement in student motivation. Teachers reported that the flipped learning model benefits a wide range of students, from the academically advanced to those with special needs. Teachers themselves stand to benefit as well. According to the same survey, 88 percent of flipped learning instructors reported improved job satisfaction after flipping their classrooms, and 99 percent said they would use the methodology again next year. 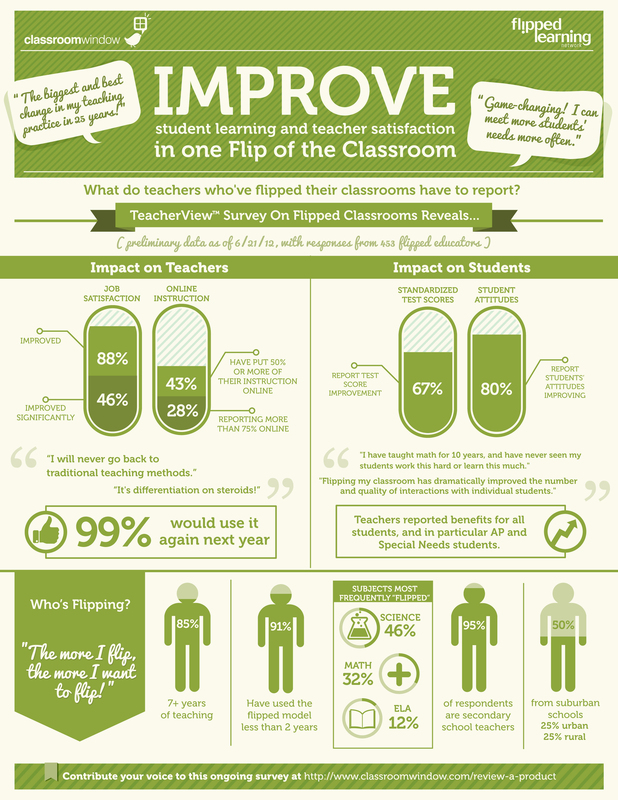 Data like this indicates that flipped instruction is beneficial to the overall learning and teaching experiences. One of the most central benefits to adopting flipped learning methods is that students are able to learn more deeply and retain material better. Because they have more ownership over the learning process and receive more frequent feedback, students are able to gain a more complete understanding of content. In addition, classrooms that incorporate flipped learning offer more opportunities to interact and learn from other students. With guidance from their teachers, students work together to solve problems and apply new concepts. This creates a stronger learning community. Finally, there is increased opportunity for feedback. Because class time is spent doing hands-on work and thinking critically, teachers can more easily spot knowledge gaps and work to address them in real time rather than waiting until test day to see how much a student understands. While research about the effects of flipped learning on K-8 student achievement is limited, a growing number of findings indicate that flipped learning approaches are beneficial in both high school and higher education settings. A one-year study examining the effectiveness of two delivery models of algebra II and trigonometry found that the flipped learning model led to higher grades. At Clintondale High School, a financially challenged school near Detroit, the pass rate for at-risk students dramatically improved after implementing the flipped learning model. A three-year study examining student performance in a flipped classroom found statistically significant gains in student performance in flipped settings and significant student preference for flipped methods. Flipped learning reframes the role of instructors and students, transforming their relationship in the classroom. Teachers who can successfully incorporate technology-based approaches like flipped learning into their classrooms are at the forefront of modern education.